After receiving his NEA Opera Honors Award this evening, Seattle Opera General Director Speight Jenkins will be heading to New York City, where he's excited to hear Marius Kwiecien--now recovered from a dramatic injury--sing the title character in the Met's new production of Don Giovanni. 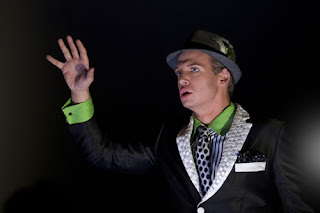 Kweicien sang the Don for Seattle Opera in 2007. 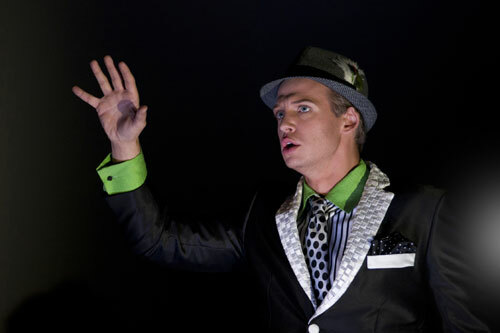 David Krohn as Don Giovanni in the Young Artists Program production of Don Giovanni, last spring. Last season, I decided to take a different approach to the typical summer training a singer my age might select. Digesting Giovanni’s 500-page score of complex Italian grammar and vocabulary made me realize how many gaps there were in my Italian training, and instead of taking years and years of language classes to compensate, I opted for a different approach. While I was studying at Juilliard, I was awarded a language study grant to learn German in Germany and Austria for a month. I went to a language school that met every morning from 7 a.m. to noon, at which time we were then dismissed to head out into Munich and explore. I discovered that I was learning twice as much German outside the classroom. So this summer I chose to go to Italy without the assistance of language schools at all; instead I got an apartment in Rome and lived as the Romans do, applying for work, getting haircuts, buying groceries, paying bills, taking the subways in the morning, reading the newspapers, watching TV... In other words, complete and total immersion. I had never been to Italy before, but somehow I made it to Piazza Crati, where I met my bed-and-breakfast hosts (neither of whom spoke more than a dozen words of English). For the next few weeks, I carried a notebook around with me everywhere, scribbling down new words, studying my vocabulary in coffee shops, testing out poorly constructed sentences with the patient and amused wait staff. Before long, I had settled into an apartment in Vitinia, a blue-collar section of town vacant of any other English speakers. I was a fifteen-minute subway ride to the Colosseum, a half hour to the Vatican City, 15 minutes to the beaches at Ostia. It was all there. 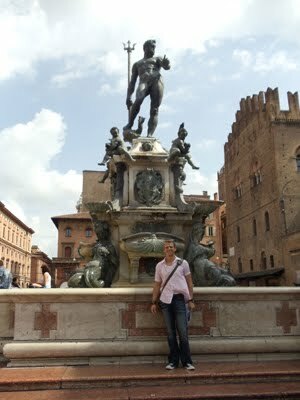 David Krohn in Bologna, in front of the famous Fountain of Neptune. I got a job teaching English to business executives near the Trevi Fountain, and though I enjoyed every minute of working with my students, I raced over to Termini Station (Rome’s central train station) every Friday afternoon, to figure out to which Italian city I would travel for the weekend. First, I went to see the canals of Venice, where Otello played in my mind (the '76 Kleiber La Scala performance with Domingo, Freni, and Cappuccilli, of course). Then I was off to Florence, to Genoa, to Modena, and even to Verdi's hometown of Busseto, with other great operas playing in my ears. David Krohn standing on the rampart of an old castle overlooking Naples. I stood atop Castel Sant'Angelo, from which Tosca threw herself in Act III of her eponymous opera, visited Scarpia's Palazzo Farnese, Lodovico's Ducal Palace of Venice. It was a world of opera. David Krohn standing in front of Milan's La Scala opera house. After a month of this, I found myself conversing with strangers everywhere, expanding my vocabulary and making fewer and fewer mistakes. Everyone who heard that I was an opera singer insisted that I sing for them, and I couldn’t resist; Italians put up a strong fight. No matter what I decided to sing for the locals, they insisted on joining in, always knowing the words perfectly, proving that the music was in their blood. 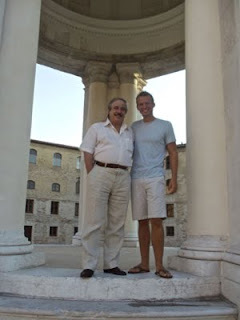 David Krohn with Marco Corelli, Franco Corelli's only living relative. One night, after about a month and a half of living in Italy, I was cooking a thank you dinner for my new Roman friends (consisting entirely of local dishes, such as Bucatini all'Amatriciana, Saltimbocca alla Romana, a radicchio dish "in agrodolce,” complete with antipasti and dolci) when the gas on the oven went out. I knocked on my neighbor Cosimo's door and, since all of the units in the building had a similar gas hook-up, he gave me precise instructions of how to reset things and continue cooking. On the way back into the kitchen, I began to laugh, realizing I somehow knew the words for "pilot light, knob, restart, gas, circuit breaker, burner, stovetop" in Italian. I can't tell you where I learned them, but it was starting to feel like I was reaching my goal. The next month and a half in Italy were just as magical. Some of the many highlights included a performance of Nabucco in the legendary outdoor arena of Verona, conducted by Maestro Julian Kovatchev, who will be conducting Madama Butterfly here in Seattle this coming May; taking a trip to Ancona to visit the hometown of Franco Corelli, my favorite singer of all time, and spending a couple of days with his family and friends; eating in Pavarotti's favorite Modena restaurants; hearing Maestro Asher Fisch conduct an Aida at the famous Terme di Caracalla in Rome; and, more than anything, learning that opera and music is part of Italy’s national pride. David Krohn atop the Duomo in Sienna, looking over the Piazza del Campo. Leaving Rome after over three months was difficult. I missed hearing the sounds of the language every day, but that was quickly taken care of when rehearsals began for Carmen just two weeks ago, which is ironic since Carmen is a French opera. Our conductor, Maestro Pier Giorgio Morandi, comes from Lombardia in the north of Italy, and has indulged my nostalgia for Italy by delivering most of my notes during rehearsals in Italian. In fact, half of the cast is fluent or nearly fluent in Italian, making me feel right at home. Already, it seems like my summer is paying off in spades. Sarah Larsen (Mercédès) and David Krohn (Dancaïre) in Seattle Opera's current production of Carmen. See you at our final performances of Carmen! A presto!